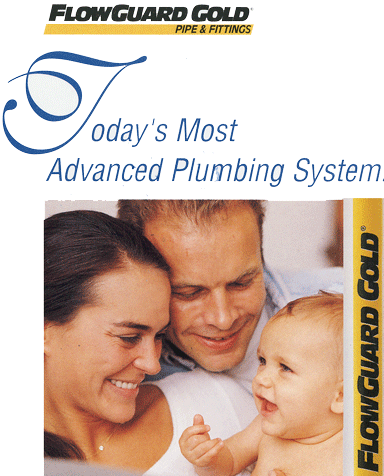 Atlantic Re-Plumbing is proud to offer FlowGuard Gold CPVC water pipes. We highly recommend using CPVC to replace your existing pipes. We are proud to use the recognized leader in the manufacturing of CPVC plumbing pipes, FlowGuard Gold. Our 25-year Warranty is the best in the industry. So, rest assured, your water pipe troubles will be a "thing of the past". Ask your estimator for more details about FlowGuard Gold CPVC water pipes. We offer copper replacement water pipes as well. Copper is a material that has been around for years. We offer "Type M" copper that carries a 25-year Warranty and "Type L" copper that comes with a 40-year Warranty. Because of the rising cost of copper and the reliability of CPVC, we rarely replace existing plumbing systems with copper. However, we are happy to install copper at the homeowner's request. Ask for details during our FREE estimate.